Several years ago I purchased a musical synthesizer with an intriguing feature - each note of the keyboard could be assigned to any desired pitch. This freedom to arbitrarily specify the tuning removed a constraint from my music that I had never noticed or questioned - playing in twelve tone equal temperament. (This is the way modern pianos are tuned. The seven white keys form the major scale and the five black keys fill in the missing tones so that the perceived distance between adjacent notes is (roughly) equal.) Suddenly, new musical worlds opened and I eagerly explored some of the possibilities: unequal divisions of the octave, n equal divisions, and even some tunings not based on the octave at all. Interestingly, it was much easier to play in some tunings than in others. For instance, 19-tone equal temperament (19-tet) with its 19 equal divisions of the octave, is easy. The 19-tet guitar in Truth on a Bus could almost be mistaken for a piece by Ry Cooder. 17-tet is harder, but still quite feasible. I had to audition hundreds of sounds, but finally found a wonderful "Celtic harp" sample that provides the basis of Seventeen Strings. In 10-tet, though, none of the tones in the synthesizers seemed right on sustained passages. It was hard to find pairs of notes that sounded reasonable together, and triads were nearly impossible. Everything appeared somewhat out-of-tune, even though the tuning was precisely ten tones per octave. Somehow the timbre, or tone quality of the sounds seemed to be interfering. The more I played with alternative tunings, the more it appeared that certain kinds of scales sound good with some timbres and not with others. Certain kinds of timbres sound good in some scales and not in others. Why is this? What is the relationship between the timbre of a sound and the intervals, scale, or tuning in which the sound appears "in tune"? Is there an underlying pattern? 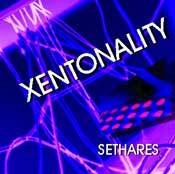 Xentonality matches tuning to timbre. My book Tuning Timbre Spectrum Scale, answers these questions by drawing on recent results in psychoacoustics, which allow the relationship between spectrum and tuning to be explored in a clear and unambiguous way. Think of these answers as a model of musical perception that makes predictions about what you hear: about what kinds of timbres are appropriate in a given musical context, and what kind of musical context is suitable for a given timbre. A key idea is that consonance and dissonance are not inherent qualities of intervals, but are dependent on the spectrum, timbre, or tonal quality of the sound. Specially designed dissonance curves show how to predict the most consonant intervals for a given sound, and the set of most-consonant intervals defines a scale related to the specified spectrum. These allow musicians and composers to create sounds according to the needs of their music, rather than having to compose around the sounds of a few common instruments. For instance, by designing special timbres, it is now possible to play consonantly in 10-tet. Listen to the "guitar" in Ten Fingers or the synth sounds in Circle of Thirds which appear on the CD XENTONALITY. The overall effect is weird, otherworldly, but it is not jarring, dissonant, or noisy. The spectrum/scale relationship provides a map for the exploration of nonharmonic musical worlds. Xentonality unites spectrum and scale. To the extent that the spectrum/scale connection is based on properties of the human auditory system, it is relevant to other musical cultures. Two important independent musical traditions are the gamelan ensembles of Indonesia (known for their metallophones and unusual five and seven note scales) and the percussion orchestras of classical Thai music (known for their xylophone-like idiophones and seven tone equal tempered scale). In the same way that instrumental sounds with harmonic partials (for instance, those caused by vibrating strings and air columns) are closely related to the scales of the West, so the scales of the gamelans are related to the spectrum, or tonal quality, of the instruments used in the gamelan. Similarly, the unusual scales of Thai classical music are related to the spectrum of the xylophone-like renat. Details can be found in Tuning Timbre Spectrum Scale,. But there's more. The ability to measure sensory consonance in a reliable and perceptually relevant manner leads to a new method that can automatically adjust the tuning of a piece based on the timbral character of the music. The pieces Three Ears and Saint Vitas Dance exploit this adaptive tuning. Of course, one might cunningly seek to maximize dissonance; the point is that the composer or performer can now directly conterol this perceptually relevant parameter. "It's clear that inharmonic timbres are one of the richest sources of new sounds. At the same time they are a veritable jungle of possibilities so that some order has to be brought out of this rich chaos before it is to be musically useful." The relatedness of spectra and scales provides an organizing principle that helps to order this rich chaos - by giving the composer control over the amount of sensory consonance or dissonance in a passage. By playing sounds in their related scales it is possible to realize the entire range from unusual consonances to startling dissonances. For more information, there is the prelude and the full table of contents to Tuning Timbre Spectrum Scale, a directory for the CD, and the full text of the paper Relating Tuning and Timbre. Downloads of many of the pieces discussed above are available in mp3 format here. A summary of the mp3s on the CD that accompanies TTSS is here, and all the mp3s on this site are described here. You can find translations of this page into Uzbek by Sherali Niyazova, into Russian by Sandi Wolfe, into Georgian by Ana Mirilashvili, into Croatian by Milica Novak, into Estonian by Martin Aus, into Slovak by Margareta Sliwka, into Kazakh by Alana Kerimova, into Norwegian by Lars Olden, into Polish by Marek Murawski, into Finnish by Elsa Jansson, into French by Jean-Etienne Bergemer, and into Spanish by Anibal Goransky.